Don't have enough snow to break out the snow blower? Try a snow brush instead! Light snow and slush are brushed away completely with this Ariens 28 inch Rotary Snow Brush. Protect your surfaces from scratches and gouging while clearing decorative areas safely. This power brush fits Ariens Compact Sno-Thro Models and Sno-Tek 920 series models. Clearing Width: Clear snow quickly with a 28 inch working width. Fits Model: Ariens Compact Sno-Thro Models and Sno-Tek 920 Series Models. Ask us about the Ariens 28" Snow Brush (Compact & Sno-Tek). Please no repair questions. Your Q&A may be posted to SnowblowersAtJacks.com to help other shoppers, like you, with their purchasing decisions. Thank you. Which Ariens 2 stage snow blower models would it fit? Would it fit Model # 921032 ? Syed, the 82000200 snow brush is compatible with Ariens Compact Sno-Thro models. 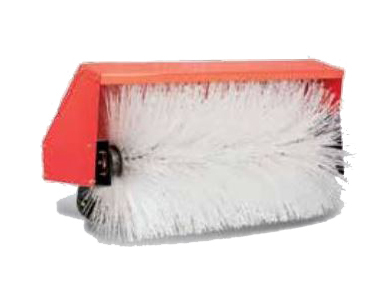 Snow brush 82100100 is compatible with Ariens Deluxe series snowblowers including the #921032 model.